Each hobby box of 2017 Gold Standard Football (seven cards per box for $150) will deliver five autograph or memorabilia cards. The highlights of this triumphant return are many and include . . .
***At least one Rookie Jersey Autograph numbered to 199 or less per box. Look for Patch, Tag and Ink variations. Patches are paired with gold ink and numbered to 25 or less; Tags are paired with white ink and numbered to only one. ***Rare and stunning Super Bowl Diamond Signatures featuring an authentic diamond. Look for dual-autographed 1/1 versions as well. ***Chase massive Laundry Tag swatches in Bullion Brand Tags, all numbered to only one. ***Basketball’s popular Base variations come to football with both Team and Photo variations throughout the base set. 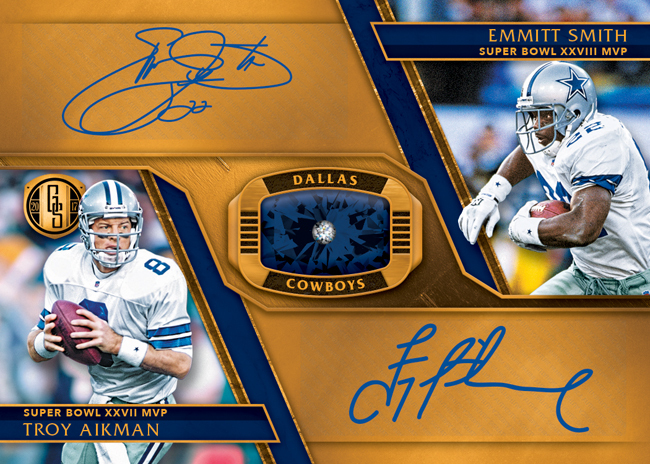 ***Gold Jacket Signatures pays homage to some of the greatest to ever put on a jersey. Leaf is pleased to announce the return of one of the hobby’s most desired draft pick releases, 2017 Leaf Trinity Football! 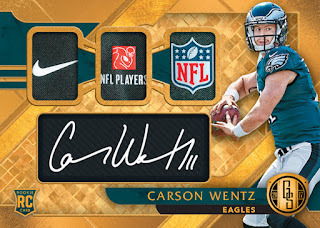 Once again, this release features ON-CARD Signature Cards (many with inscriptions), Auto Clear Cards and Auto Patch/Jersey Cards. With the best selection of elite prospects, with a special emphasis on skill position players, 2017 should deliver incredible value as this release typically does year in and year out. Each box will contain 5 on-card autographed cards.